Upcoming guitars include a Les Paul Standard with Fifites specs, Double-Cut Junior and SG Modern. NAMM 2019: In advance of the 2019 winter NAMM show, Gibson has announced a slew of new electric guitar models, led by a Les Paul Standard with classic Fifties specs and a Standard with Sixties specs. “We’re paying tribute to the Golden Era of Gibson by restoring authenticity for musicians with our new lineup of Classics,” said Chief Merchant Officer Cesar Gueikian. Other new models include a Les Paul Standard with P90 pickups, a Les Paul Special in TV Yellow, a Les Paul Junior Tobacco Burst, an SG Standard and two new ‘61 spec SG’s with “maestro” and “sideways” Vibrolas. The new Contemporary lineup includes a Les Paul Tribute Double Cut Junior with a single P90 and a Les Paul Tribute Double Cut Special with dual P90’s. 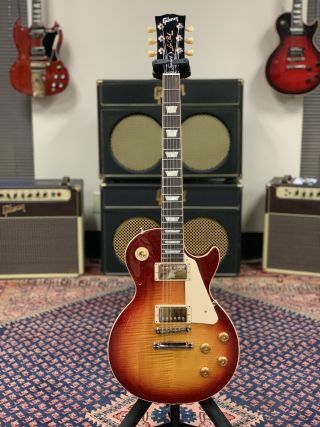 The Contemporary line also features a new concept: the Les Paul and SG Modern, which incorporate lighter-weight bodies, slim taper neck profiles for full-access to the high frets, ebony fingerboards, high-output versatile pickups and a push-pull control system to pivot between the humbucker and the P90 sounds. Check out some of the new models below, and head over to Gibson for more information.